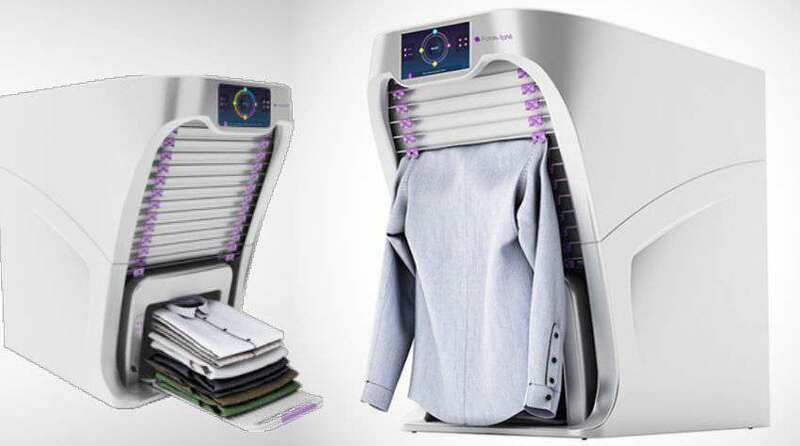 A US-based startup company designed and launched a multi-purpose apparel folding robot ‘FoldiMate’, a robot that folds apparels by sensing the size and thickness of the fabric. This handy robot friend is an all-in-one machine that folds, perfumes and de-wrinkles the apparels after one selects the type of fabric and other settings through the buttons provided on it. Foldimate has been at work the past few years designing an at-home model of its innovative device. After tweaking its technology, the company is gearing up to make the Foldimate available to the public by 2018. Foldimate is capable of folding everything from shirts and sweaters to jeans or sweatpants, the only things it can’t handle are larger items like linens or smaller pieces of clothing. Standing 32 inches tall by 28 inches wide, the Foldimate would fit nicely in most laundry rooms and is also capable of being moved from room to room depending on space. It only weighs around 65 pounds. Speedwise, the device is said to take roughly 10 seconds to fold most items and an extra 20 to 30 seconds to get rid of wrinkles using steam. Users can easily hang the clothes on a rack attachment that which takes in the clothing and gives out the perfectly folded apparels. The cost of the robot is estimated to be around $700-$850 and would be available for pre-order in 2017.